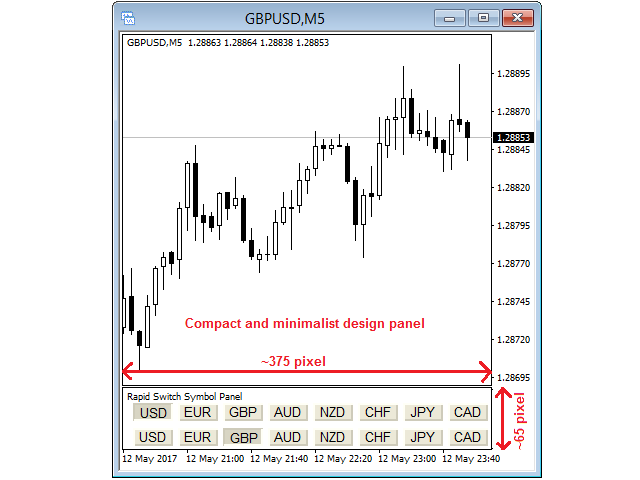 This utility allow you to switch your chart symbol rapidly by simply clicking on any two of the currencies that made up the currency pair. The supported currencies are USD, EUR, GBP, JPY, AUD, NZD, CHF and CAD. There are two rows of buttons at the panel. 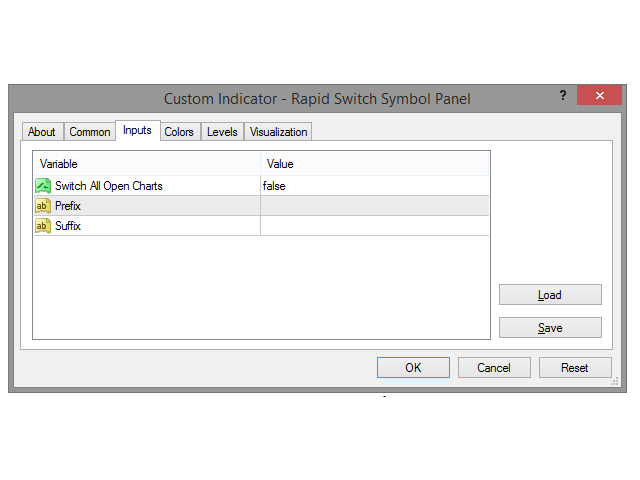 To switch to a new chart symbol, all you need to do is select a currency from each row. It is not necessary to click the currencies in a correct sequence because it is designed to auto match your choice of currencies to the available symbols. For example, just click on GBP button at either rows and USD button at the other row if you want to switch to GBPUSD. An error sound alert ("timeout.wav") will be generated if you try to click on the same currency at the both rows or the symbol is not available at the Market Watch menu. Switch All Open Charts - Self-explanatory. Prefix - Enter the additional notation at the beginning of the standard currency pair notation. Leave it blank if none. Suffix - Enter the additional notation at the back of the standard currency pair notation. Leave it blank if none. Remark: Your MT4 terminal may "freeze" for a while or completely hang if you set Switch All Open Charts to true and all your open charts have a lot of indicators that required heavy calculations. So, use this feature with cautious. Super! Best Pair Switcher, or at least one of the best!